Home » He Speaks! » My Wife’s First Mother’s Day: What Do I Get Her? My Wife’s First Mother’s Day: What Do I Get Her? Posted by Sarah on May 7, 2011 in He Speaks! 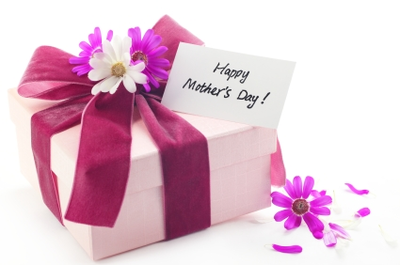 | Comments Off on My Wife’s First Mother’s Day: What Do I Get Her? I’m normally a great gift buyer, but since our son was born in February this will be my wife’s first Mother’s Day (well, she has a mother so the first as the direct object in a Mother’s Day sentence). I have never bought someone something on Mother’s Day (well, I have a mother, so the first time buying a gift for a mother I sleep with.) This is apparently a big deal. Everything I read says this is a big deal. Strangers at work and on the subway say this is a big deal. I get it, but what I don’t get, is what I’m supposed to do about it. I want Mother’s Day to be special for her. It’s a lot of pressure, and I have no idea what to get her. Normally when I give my wife a present it shows how intimately I know her and love her. I like doing things that fit her interests or give her a chance to do something that she wouldn’t do for herself. The problem is that the only thing we’re currently interested in is our son, and he still smells like plastic he’s so new. In my desperation, I turned to the Internet to see what wisdom people I probably wouldn’t talk to in real life have to offer. And the first thing I found was about 96 sites emphasizing that the first Mother’s Day is a very special day for new moms. Thanks for the added pressure, Internet. Not useful. Here’s the one thing I’ve learned about being a dad — no matter how much my son loves me, no matter how many diapers I change, and no matter how much spit up I clean off the couch I am fairly replaceable. I am not being self-deprecating or feeling sorry for myself, but that’s just the way it is. My son is three-months-old this Mother’s Day. My wife carried him, my wife feeds him, and my wife’s essence has been part of his existence since he had gills. What I can do, what I feel like I have to do, is make sure that her first Mother’s Day is special so that she knows how grateful I am not just for what she does, but also for giving us our son. Of course this means I have to keep searching the Internet. Here’s one thing that’s great about being a dad in 2011. I do not have to be ignorant of anything for long. Bring on the questions, son. Daddy has the Internet. Why’s the sky blue? Internet. Why can’t dog’s talk? Internet. The Internet has answers for everything, but what it doesn’t have is wisdom. After a lot of commercial sites (the “World’s Newest Mom” cup was almost the winner, but I would like to actually stay married), I was finally able to get to some which had real suggestions. A lot of suggestions. Too many suggestions. Damn you and your free and easily accessible information, Internet! This came up a lot and I get it, but I have a few problems with this one. Second, my wife and I really enjoy being with our son. The way most of these people talk you’d think that being a mom the worst job in the world. I can see “relieving” her as a reward if she was a garbage collector, coroner, or Republican spokesperson, but she loves being with our son. Third, if you don’t already do these things then the best thing you can give her for Mother’s Day is an apology. Flowers are an awesome gift…on a Tuesday. You can buy flowers at the grocery store. Are they really that special anymore? Besides, the symbolism is terrible. Nothing says “Happy Mother’s Day” less, in my opinion, than pretty things that die in four days. I might as well get her a goldfish in a plastic bag. Also, it’s not like if Mother’s Day didn’t exist I would prohibit any photo albums from being created, so it would be more a “two birds, one stone” kind of thing. I still think this is a good idea, but it no good for this Sunday. This is sort of a go to gift for a lot of people. I’m lucky because I have no real desire to live within my means, so we do this fairly regularly. While this means that we spoil ourselves often, it also means that for me this isn’t a present. “Hey honey, let me take you out to eat like I did last week, but this time it’s for Mother’s Day” isn’t really the type of special gift I’m looking for. Even if one doesn’t normally go out to eat, isn’t going out to dinner a given on any special occasion? I know I probably should take the mother of my child somewhere nice on Mother’s Day since she did let a human being come out of her. But I’m going to make sure it’s a restaurant that is meaningful to us. It doesn’t have to be the fanciest restaurant ever as long as it doesn’t serve its drinks in waxed paper cups. But is this enough for a first Mother’s Day? I don’t think so. Are we still the generation of jewelry? I know “every kiss begins with Kay,” but my wife isn’t really into that thing. If your wife is a jewelry person then this would make sense I guess, but since mine doesn’t like rings, necklaces, bracelets, anklets or broaches this doesn’t work in my case. Also, guys are terrible with jewelry. Seriously. The only reason we even think women like jewelry is because we watch movies and remember Richard Gere snapping that case shut on Julia Roberts. We think women like jewelry for the same reason women think we hate shopping—80’s comedians. I loved this idea. I could get her a massage or a facial or something else that will require her to leave the boy with me while she gets pampered. Plus it will extend Mother’s Day until the time when she actually gets the treatment so if I take her to brunch and get her this it will be like she has two Mother’s Days. I live in Boston and when I type “Spa” I get about a jillion places that offer some sort of spa service. So I made the executive decision to go with a facial to narrow down the list. Did you know there were nine thousand kinds of facials out there? Did you also know that choosing a facial requires you to know your wife’s skin type? Did you know there were skin types? This makes this choice dangerously close to the “lingerie” category of risky gifts. I can hear the, “are you saying my pores need extracting!? !” already. So after much consideration I’m going to go with the spa idea. To avoid any slip ups I’m going to get her a gift card. This essentially means that I’m getting her cash, but I think she’ll like it. I’m also taking her (and the boy) to a French bistro we like for brunch and my son is getting her a card. Hopefully this works to make it a memorable first Mother’s Day because I love my wife and want her to realize how grateful I am for our son and for our life together. As I type this I realize that I have given absolutely no thought to my own mom’s gift. Thank God for Hammacher Schlemmer.